Some images beg for a closer look. At first glance, this is a sad scene of a beached whale being inspected by curious onlookers. 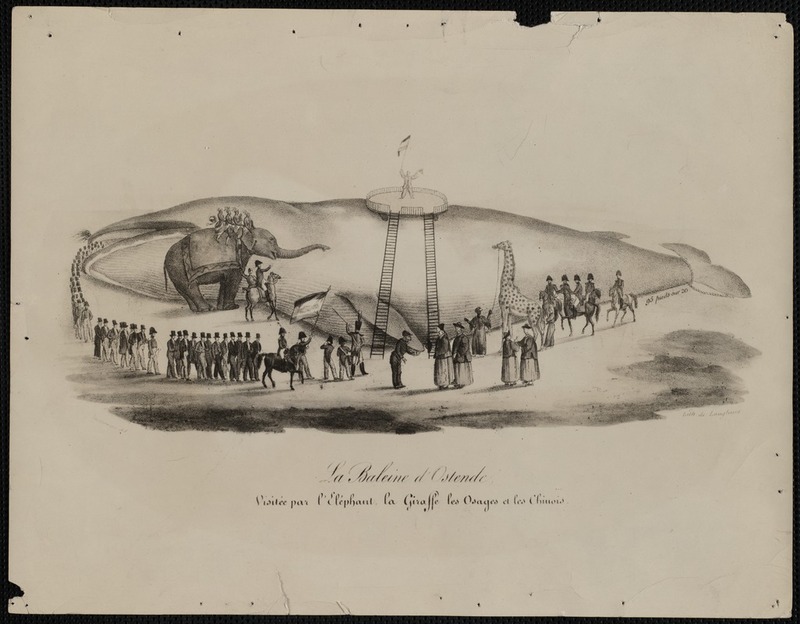 However, the caption reads, “La Baleine d’Ostende/Visitee par l’Elephant, la Giraffe les Osages et les Chinois.” Elephant? Giraffe? What exactly is going on here? Why did an elephant, a giraffe, six Native American Osages and four Chinese people visit a beached whale in Ostend, Holland? (As it was then; now it’s Belgium.) And what of all those men (no women) in cutaway coats and top hats parading out of the whale’s mouth? In fact, we are dealing with early fake news. 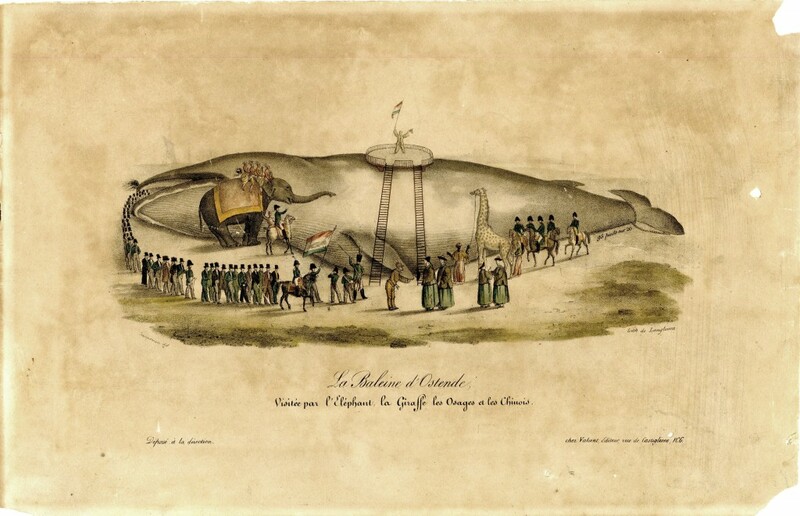 Oh, the whale did wash ashore in Ostend in 1827. H. W. Dewhurst gives an account of the whale’s arrival and its skeleton’s subsequent travels on exhibition in his 1834 book, The natural history of the order Cetacea. It’s the whale’s visitors who are “alternative facts”. Early 19th century Europe had a fascination with the exotic: people, places, animals. Giraffes and their keepers toured Europe at this time. Six Osages traveled to France in 1827. The Chinese people in this photo are elsewhere identified as Jesuit missionaries. The Jesuits had a history of traveling between China and Europe. But none of them showed up to visit the whale at Ostend. They are here because the lithographer, Pierre Langlume, also had a taste for the exotic and brought them together in his print. The unsurprising thing about this image is that it is from the New Bedford Public Library collection. New Bedford’s history with whaling makes this a natural item of interest. The surprising thing is that the library also owns a lithograph of the image and the photo may not be of that lithograph, but of another printing. Compare the two images for minor differences. Finally, I leave it to you to tell me about the man on top of the whale within a circular enclosure. He has doffed his hat and is waving a flag. I can’t help but see a clown in a one-ring circus, but your view may differ. Have you found or posted an image on Digital Commonwealth that deserves a closer look? Tell us which one and why or direct us to it by emailing outreach@digitalcommonwealth.org. Posted in A Closer Look.Tagged elehant, giraffe, whale.